The famous fishing port of Gloucester, Massachusetts has been an inspiration for generations of American artists including Fitz Henry Lane, Winslow Homer, Edward Hopper, John Sloan, Frederick Mulhaupt and countless other painters, sculptors and writers including Rudyard Kipling ( Captains Courageous ) and Sebastian Junger ( The Perfect Storm ). 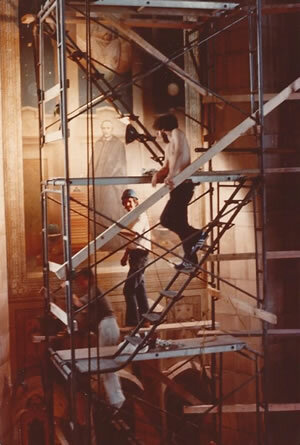 It was with a great sense of pride that our company was selected to restore the Charles Allan Winter murals at Gloucester City Hall, a distinguished architectural landmark in a city which was and remains to this day a destination for artists of all manners of expression. The Lochoff/Bellini Altarpiece is located on the campus at St. Mark’s School in Southborough, Massachusetts. Over a period of 85 years it was coated with layers of natural resin varnish which had severely darkened and obscured the colors. When our company slowly removed the old varnish, many observers, including members of our staff, were very excited by the result.